I didn’t really realise until I was writing this how much my early baking was skewed to baking for the masses! This is my third cake or slice recipe cooked in the same pan, which makes 30 or 40 slices. Happily, if you weren’t planning on feeding a crowd, this recipe is easily halved to cook in a standard 20cm square pan. The standard version of this uses what I like to think of as a particularly Australian combination of fruit, with apple, banana and passionfruit (below). 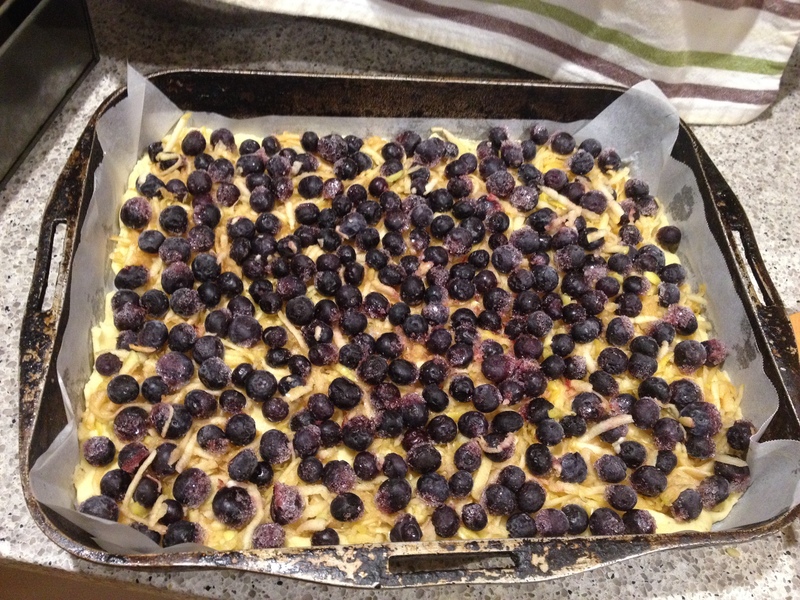 (The version pictured above uses apple and blueberries instead as I had frozen blueberries to use up). The apple and banana gives a lovely contrast in flavour and texture, with the passionfruit adding that lovely scented tartness to the mix. The shortcake is quite cakey on the bottom, with a crisper, crumblier texture on the top that’s a lovely contrast to the filling. I like the original the best, but this is a very flexible recipe and also works with apple and rhubarb, and I think I once used peaches too. 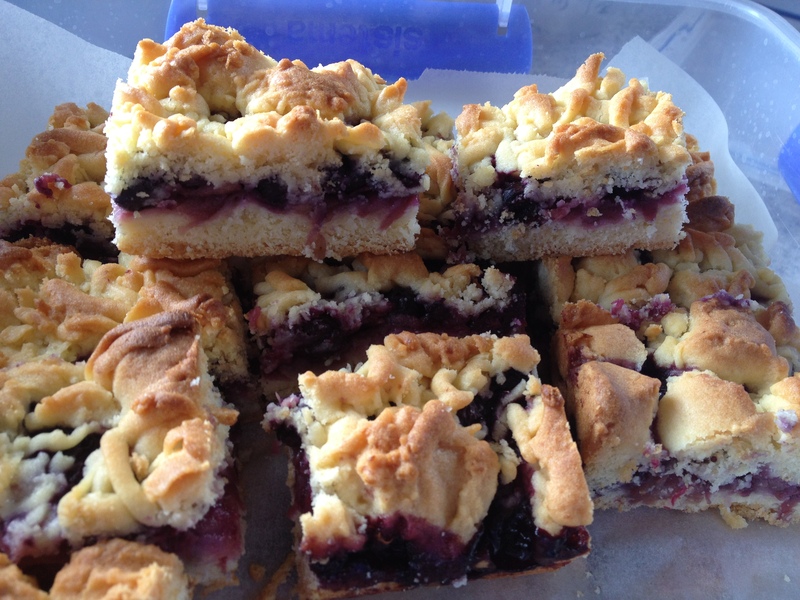 It’s a great picnic dessert, as it’s quite sturdy, and can be eaten as a hand held slice without needing plates or cutlery, though it’s also lovely for afternoon tea with a cuppa! Preheat oven to 180C. Line a 27x33cm tin with baking paper. Cream butter and sugar, add eggs one at a time, then mix in flour and salt in two lots. You should get a slightly crumbly dough – don’t worry about trying to get it into a ball. Press slightly more than half of the dough into the tin. The other half needs to be crumbled over the top, so if it’s too soft, chill in the freezer while preparing the filling. Sprinkle the grated apple evenly over the dough, and top with either sliced bananas or berries. If using bananas, dollop the passionfruit over as well. Grate over the lemon zest, and squeeze over the lemon juice. If using rhubarb, or very tart berries you will want to sprinkle some extra sugar over the filling. Once the remaining dough is chilled, crumble evenly over the top. If it’s not crumbling easily, grate the firm dough with a box grater as I’ve done above. Sprinkle top with extra sugar and a scattering of cinnamon and about a tablespoon of water. Bake for approximately 30 min until the shortcake is firm and golden brown. If the blueberries are frozen it will take slightly longer. Cool in the tin, and slice once cold – though if you don’t mind messy slices, then by all means serve warm with cream or ice cream! It will last for several days, though the topping will get soft from contact with the fruit after a day or two. Beck, I am soooo glad this wonderful family staple has come around. I like the idea of the rhubarb and berry variations, too. I must say, the blueberry looks a fabulous colour. Speaking of food for the masses, I have just made 2kg plums into plum cheese. Stunning colour and flavour with added lime, vanilla pods and peppercorns. It took me hours, but the gift potential is very satisfying. I haven’t stopped by for awhile, and when I do: THIS!! Really, it looks so good! Black currant store? Oh you lucky jam maker, you! am just about to make this!! can’t wait!! Enjoy! Are you making the ‘classic’ version? was it just like you remembered? Love this looks so amazing! nice mix of fruit as well! yes it is! Love your blog name as well!